Martin Roberts and Lucy Alexander visit a building plot in Kent, a south London mid-terrace and a two-bed bungalow in Gateshead, and find out how much they sold for at auction. Martin Roberts and Lucy Alexander visit a two-bedroom semi-detached house in Derby, an old club house in Dorset and a three-bedroom semi-detached house in Cumbria. Martin Roberts and Lucy Alexander visit a derelict house in Darlington, a one-bedroom flat in West Hampstead and a former social club with a first-floor flat in Devon. 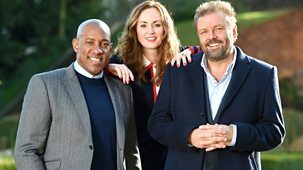 Martin Roberts and Lucy Alexander visit a house in Bishop Auckland, County Durham, a small cottage in Hythe, Kent and a plot of land in Chippenham, Wiltshire.